A slim and discreet pad designed for moderate incontinence featuring an absorbent core. 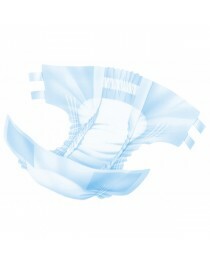 The Attends Soft 3 Extra Plus are urinary incontinence pads that are slim and discreet when attached to underpants. They have been designed for moderate incontinence. There are other Attends products for minor leakage or heavy or severe incontinence issues if these aren’t the right product. The pads are slender and fit discreetly inside clothing so no one is aware they’re there. They’re made of white, soft, absorbent materials, and have a blue star design. These pads are in a U-shaped or cupped style, so they follow the natural contours of the body. The Attends Soft 3 Extra Plus have an absorbent core that absorbs moderate levels of bladder leaks. This absorbent core not only siphons fluids inwards but keeps the skin dry and comfortable. The liquids are held inside, which prevents leaks that can impact clothing or furniture. There is a breathable textile backing that rests against the skin. This provides a way to keep the skin dry but comfortable. It will mimic the feel of normal fabric so the wearer will forget they are wearing Attends pads. These Attends pads are in a range that feature an anatomical shape that flows around the natural curves of the body. They fit discreetly with people’s own clothing and boost the confidence of the wearer who has the occasional urinary leakage due to illness, disease, aging, or after-surgery care. The Attends Soft 3 Extra Plus have an adhesive strip that attaches to underpants and keeps them secure. The pads provide a level of odour protection that also adds to the discretion of the pad. The inner core masks any bad smells, which is an additional layer of protection. The pad doesn’t need to be immediately replaced with a gush, as it can hold a good absorbency range, so adults who are enjoying their usual activities can finish them, then discreetly excuse themselves to change the pad. There are 10 Attends Soft 3 Extra Plus in each pack. One pad measures 36.5cm in length, with a front width of 13 cm. These pads have a high absorbency range of 799ml. The higher the ml volume, the greater the urinary incontinence solution it can provide. Lower volumes means they’re more for mild or light incontinence. • Easy fitting and removal. • Adhesive strip keeps pad in place.